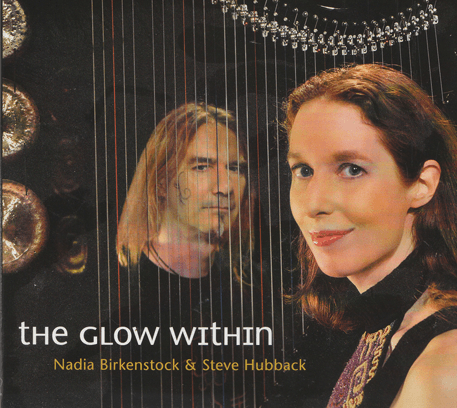 Ethereal and haunting The Glow Within intertwines the beautiful Celtic harp playing and voice of Nadia Birkenstock with the amazing percussion of Steve Hubback. Tracks include original pieces together with traditional English, Scottish, Irish and Breton folk tunes. Although full justice is given to the traditional songs the highlights for me were the tracks written by the very talented Birkenstock. The first of these is the title track, The Glow Within, a beautifully haunting instrumental. Distant Shore, with expressive poetic lyrics is a gentle tale of loss and mourning, reminiscent of a traditional folk song, “I will wander to a far off place now. So do not cry and do not mourn. There’s a new path for me that awaits now. To reach a distant shore”. Another instrumental First Snow is perfectly evocative of snow falling and of the childlike joy and wonder this can bring. There is also the uplifting and very lovely Shine “what if I gave a smile to you … what if I lifted up your heart”. This wonderfully melodious collaboration of musical talent most certainly lifted my heart: highly recommended. For more information, samples and to buy visit The Glow Within. Visit Steve Hubback for more information on his metal craft. The Glow Within was reviewed by June Kent, editor of Indie Shaman magazine. Audio CD also available via Amazon – link below.